NEWLY-RENOVATED! Courtyard Houston Downtown/Convention Center is in a prime location of Space City. 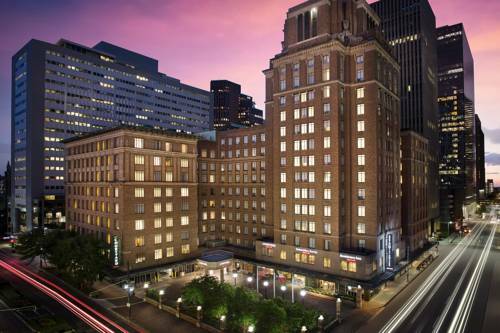 In the city's historic 1921 Humble Oil Building, the hotel's exterior still has the original, neo-classical style with polished rose marble and brass elevator doors. Our hotel in Houston, Texas puts you in the pulse of the city and within walking distance of the George R. Brown Convention Center, Toyota Center and House of Blues. The MetroRAIL is right outside the hotel to take you even further. Newly-renovated rooms and suites feature high ceilings and natural light, along with modern decor, mini-refrigerators and plush bedding. Stay connected to family, friends and business colleagues with the free Wi-Fi throughout our hotel, including in our bistro offering a variety of healthy and hearty menu items plus Starbucks coffee beverages. Escape the Texas heat in our outdoor pool offering great views, or work out in our well-appointed fitness center. Enjoy your stay at Courtyard Houston Downtown/Convention Center.